THE B-MOVIE NEWS VAULT: STOCK YOUR VAULT: New DVDs & Blu-rays for 10/17/2017! STOCK YOUR VAULT: New DVDs & Blu-rays for 10/17/2017! Greetings Vault Dwellers! We're just two weeks away from HALLOWEEN, can you believe it?! Yet oddly enough, there doesn't seem to be a major increase in new Horror titles on DVD & Blu-ray. Wes Craven's SUMMER OF FEAR comes to Blu-ray courtesy of Doppelganger Releasing, and Mill Creek Entertainment releases MARY REILLY (a Jekyll & Hyde tale) to Blu-ray disc. 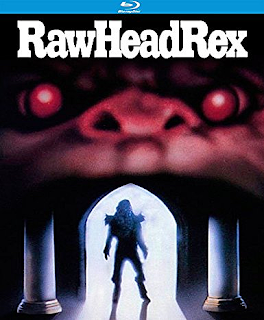 But it is Kino Classics that wins the week by giving ROLLING VENGEANCE its Blu-ray & DVD debut, plus they have just unleashed a great Special Edition of RAWHEAD REX! The disc boasts a new 4K remastered transfer made from the original negative, a new audio commentary, and a wealth ofcast & crew interviews! As for the remainder of this week's releases, there are a slew of DVD & Blu-ray boxed sets, with several focusing entirely on DC's superheroes. (Not too shocking since JUSTICE LEAGUE is less than a month away from a theatrical release!) Also, many of Studio Ghibli's feature-length animated films are being re-released to DVD & Blu-ray, which might be of interest to some of you anime fans! To see the full list, start scrolling down! Contains: Superman - The Movie, Superman II, Superman III, Superman IV: The Quest for Peace, Superman Returns, Batman (1989), Batman Returns, Batman Forever, and Batman & Robin. Contains: Wonder Woman, Suicide Squad (Extended Cut), Man of Steel, and Batman V Superman: Dawn of Justice (Ultimate Edition). Contains: Resident Evil - Damnation, Resident Evil - Degeneration, and Resident Evil - Vendetta. Contains: Mad Max: Fury Road, The Road Warrior, and Mad Max: Beyond Thunderdome. Contains: Journey to the Center of the Earth, Journey 2: The Mysterious Island, Pan, The NeverEnding Story, and The NeverEnding Story II. Contains: 300, 300: Rise of an Empire, Clash of the Titans (1981), Clash of the Titans (2010), and Wrath of the Titans. Contains: Forbidden Planet, The Time Machine, 2001: A Space Oddysey, and Soylent Green. Contains: Naked Amazon, White Slave, and Sacrifice of the White Goddess.